On October 25th, 2018 the UConn graduate student chapter of the AMS held their Second Annual Integration Bee, where undergraduates of varying levels of mathematical background came together to test their knowledge of integrals. Students took turns in groups of six, going to the blackboard to compute various integrals on the spot. In each round a student had four minutes to compute an integral, and if time ran out or the answer was incorrect a student received a strike. After two strikes a student was out of the competition. After an hour and half there were two finalists and five other students competing for third place. The rivalry was pretty intense among students for third place. They all stayed in the competition for round round after round until they were asked to integrate cos(ln(1/x)). Only Nick Juricic evaluated it correctly and he got third place. The two finalists were Samuel Degnan-Morgenstern and Zhongwei Wang. The final battle between them was very dramatic and exhausting for both. After about another hour Samuel was the winner for successfully integrating 1/(e^2-x^2). Contestants who scored in the top three won prizes that were generously donated from our sponsors: Cengage, Lizzie’s Curbside Catering, and Moe’s Southwest Grill. Although there were only three winners who officially won prizes, all students attending the Integration Bee received a nice meal compliments of the AMS and the joy of solving math problems. 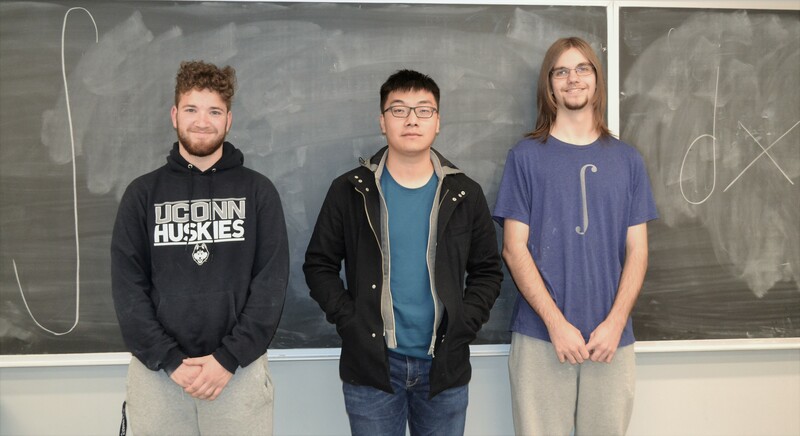 Pictured from left to right: Samuel Degnan-Morgenstern (1st place), Zhongwei Wang (2nd place), and Nick Juricic (3rd place).